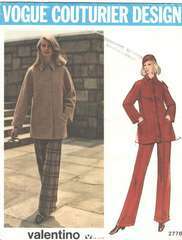 Loose-fitting short coat has bias collar and buttoned band closing. Welt pockets. Full length kimono sleeves with gussets. Top stitch trim. Wide, straight-legged pants, darted into contour waistband, have front zipper closing, cuffs and full lining.